The wooden ring is very cool modern style geometric jewelry. It has very interesting geometric form of leaf. Measures: 1.96" in length and 0.78" in width (5.00/2.00 cm). Available in sizes 3 through 9 in half size increments. Made to order in 2-3 days. If these sizes do not meet the measure of your finger, do not forget to state your size, please! 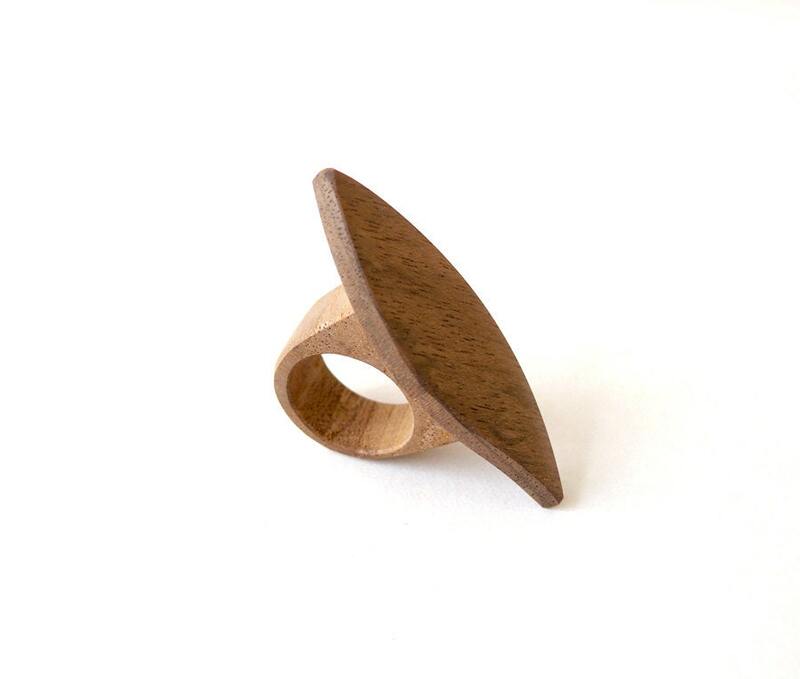 Materials: The geometric wooden ring is handmade from compilation of two parts- ring wooden base and wooden leaf. The handmade natural wooden ring is handmade of wood- walnut wood. Surface of the woods are hand polished to make them brilliant. The woods are protected and nourished with natural polishing wax. Polishing wax contains valuable natural waxes, pure beeswax and carnauba wax. Does not contain silicones and aggressive for the environment agents. The wooden ring is very lightweight. It is as light as a feather, making it very comfortable to wear! The wooden ring come packaged in a gift box. With our jewelry, you will always be in the spotlight. You will never go unnoticed. Our jewelry are best to focus your great vision. This unique wooden ring is completely natural and eco-friendly product! I have done my best to show accurate color. Please allow for slight difference due to monitor settings, and photo lighting. Wholesale: Custom requests and wholesale orders are welcome! Please message me for details - prices and special orders! To see more wood jewelry, click the link below! Thank you very much for visiting our "cool Jewelry Shop" !!! The Walnut stud earrings looked quite different than on the picture. Also the clasps didn't fit on the studs, so I had to use old ones. I'm a bit dissapointed. Perfect! So simple and classic, but the small touches like the engraving and the finish make it lovely!